Hello Fashion Saucers! I’m so sorry for my absence during the past week; I was lucky enough to attend the magical Bonnaroo Music & Arts Festival for my third time, and I only just got back to Boston. Since we photographed a few of my outfits solely on disposable cameras, it’s going to be another day or two until I can write up a post detailing my time at the festival. I also must confess, although I saw infinite cool and creative festival attire on fellow Bonnaroovians, I was too busy enjoying music, food, and other festival pleasures to photograph as much street style as I would have liked. The sights and sounds of Bonnaroo are best taken in through your eyes, not through an iPhone. But sit tight and stay tuned for what I feel may have been my best festival wardrobe lineup to date, and lots of products and tips for fashionista festival survival—plus I have some awesome real-world outfit posts coming your way, as well. Until all my photos are ready, you can always snag a sneak peek of my festival fashion on Instagram. 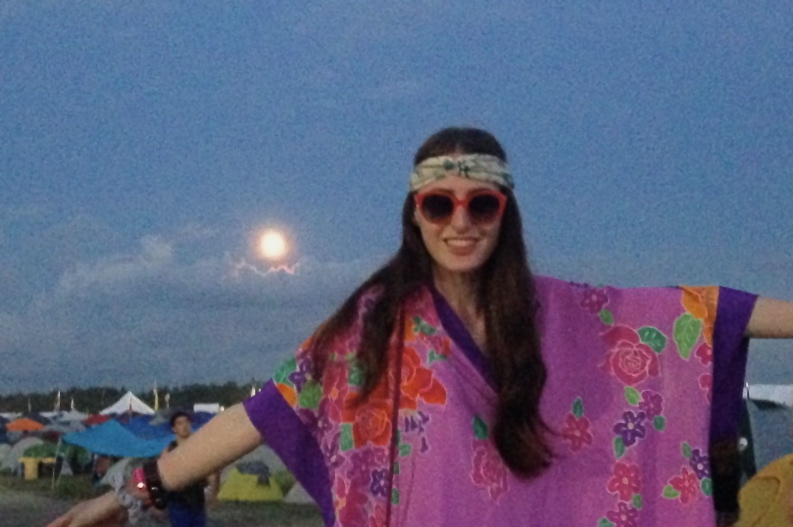 Vintage Oscar de la Renta kimono dress (via Nasty Gal in 2010), printed turband from LF Stores, Chanel sunglasses, and a beautiful full moon.